For the latest changes and updates on the North Atlantic, including our most recent Guides and Charts, use our NAT reference page at flightservicebureau.org/NAT. Updated Oct 15, 2018: Updated RNP requirements for the PBCS Tracks, updated entry requirements for the NAT Tracks. Confused and overwhelmed with the changes on the North Atlantic of late? Especially with PBCS, RCP240, RSP180, RLAT, RLong, and all that? Yep, us too. So, we drew a circle. Tell us if this helps. Click on the circle to download the more detailed PDF. 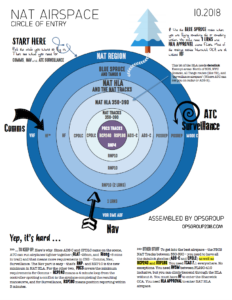 Download the NAT Circle of Change 2018 PDF.